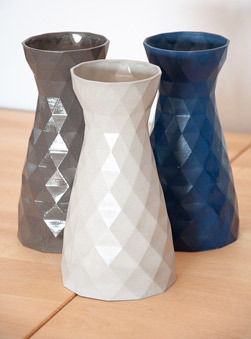 FK chat to friends Dai & Rory, who bring slip casting to a new level with their 3D modelling homewares label Cool Grey One. Tell us a bit about Cool Grey One and what products we can expect to discover? 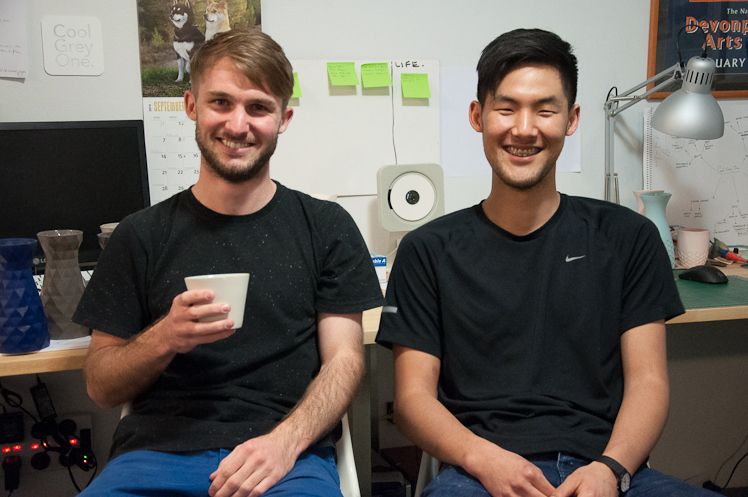 Cool Grey One is Dai Jang and Rory Wilson, and we’re both recent graduates of the Industrial Design program at UNSW. You can expect to discover interesting objects that are technical, detailed and interesting to look at. Our study taught us about conceptualising and presenting ideas; mass production and manufacturing; but it doesn’t really teach how to actually make anything. We leave that to engineers. So we wanted to find something to fill the gap. Dai had some friends at COFA, and we took up some courses there in slip casting. I think it appealed to us because it’s so repeatable and the process is similar to injection moulding and mass manufacturing. 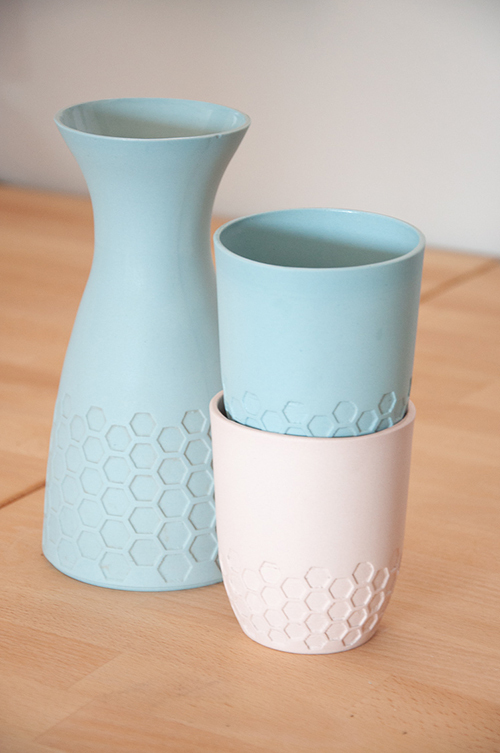 We like knowing that every piece that comes out is basically identical. 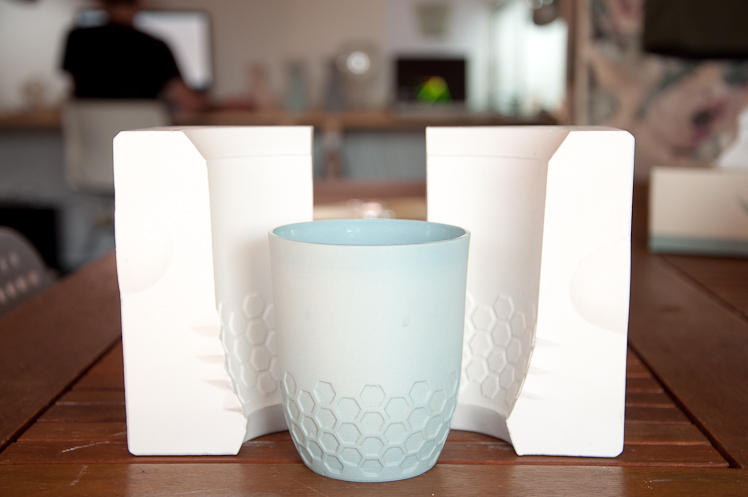 Merging our skills as product designers with artisanal skills like slip casting and mould making is something we enjoy. Well obviously we like to work within the confines of 3D modelling. I think we consciously exclude analogue or hand-modelling processes to create prototypes for our work. 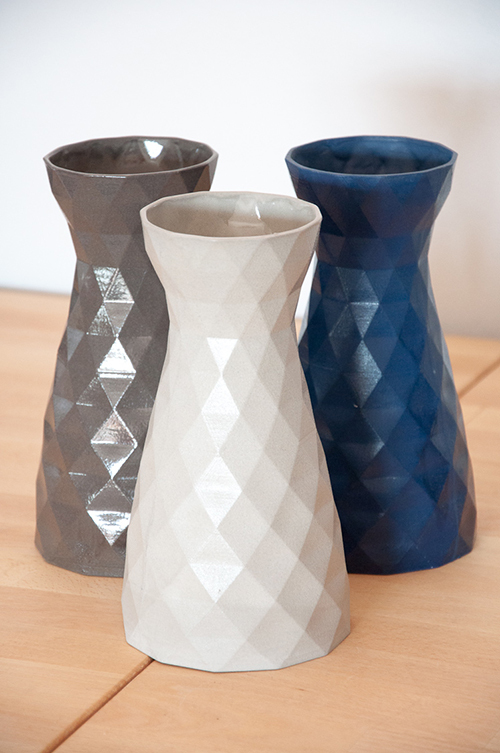 We’re trying to do things that can’t be done by hand – not everybody can make ceramics, but even less people can make ceramics with digital modelling. We want our work to express its origins in the digital medium. If it doesn’t, we could just be doing it on the wheel or from clay and that’s not what we want to be seen as. What is your workspace like, and what is your creative process? We work from home. We both have full time jobs and fit our Cool Grey One work in around that. It means we usually work nights and weekends to make new things. Our usual process is to toss an idea around between the two of us, throwing out what we think won’t work; keeping the things we think will and massaging the ones that might. We like having free reign over what we do and just going with what we like. We’re not very pretentious about what we do – we just want to make things that people like to look at, and therefore to use. Actual making usually takes place in the converted garage, and we have a long combined bench workspace upstairs. 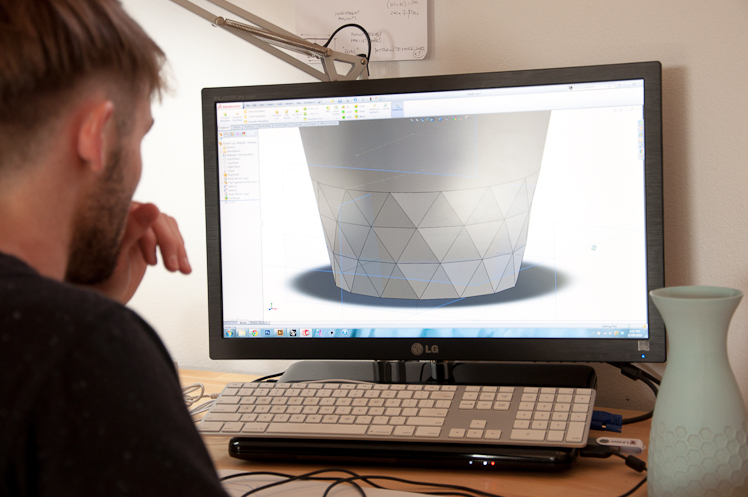 What do you love about working with 3D modelling and slip casting? What are some of the challenges? 3D modelling lets us try new things. We like the high precision nature of working with these programs. Theoretically we can work down to the tolerance of the machine when producing patterns for moulds, that’s to levels of accuracy like 0.1 millimetres. Slip casting, although quite ancient and low-tech, is pretty faithful when it comes to reproducing what we can do with these programs. We like this kind of opposition between low and high- tech. I guess the challenge we often face is working out a way to model what our minds can think up. The programs give you certain confines to work within, and you need to use those to model what you want your object to look like. That can be fairly difficult or confusing at times, but when you crack it is a nice moment. Detailing and finishing the casts is time-consuming but also relaxing. What can we expect to see from Cool Grey One at the upcoming Sydney Markets? 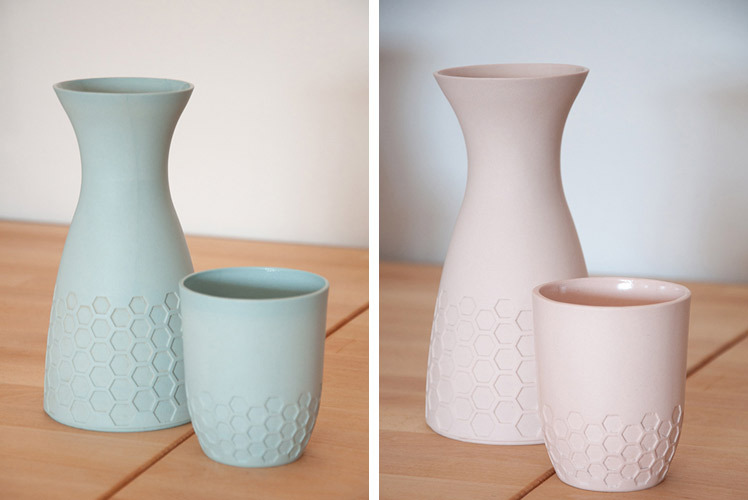 An interesting take on slip casting – and hopefully something new, that makes people think a bit differently about ceramic objects. 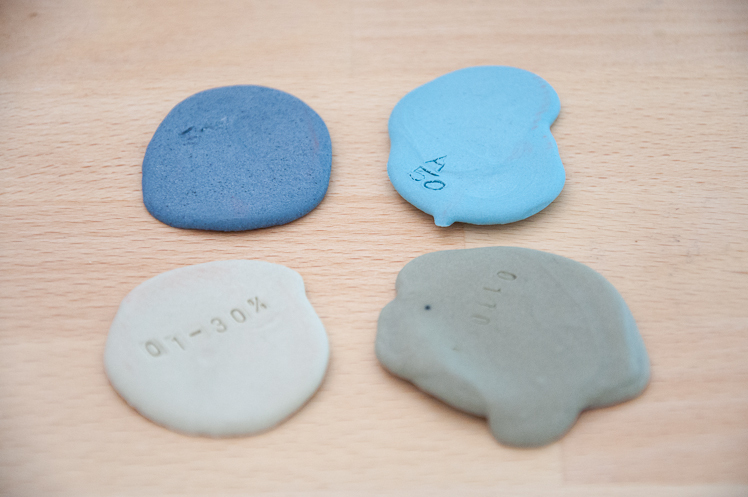 We’re used to seeing analogue processes in ceramics – throwing, or models originally made by hand from clay. We hope we can give you a slightly new perspective. We hope you’ll also see something you want to take home with you!